Facebook, what's up with that weird graphic that shows up after you log off? Facebook, what’s up with that weird graphic that shows up after you log off? We’ve all seen that status update – you know, the one that’s clearly your friend trolling you for forgetting to log off Facebook on their computer. My usual solution is to use Chrome’s incognito mode, but if that’s not an option, the next time you log off Facebook you might be greeted with… THIS. What the hell is it? Where are these two going? Why does it look like one of those free clip arts from a 1999 version of PowerPoint? 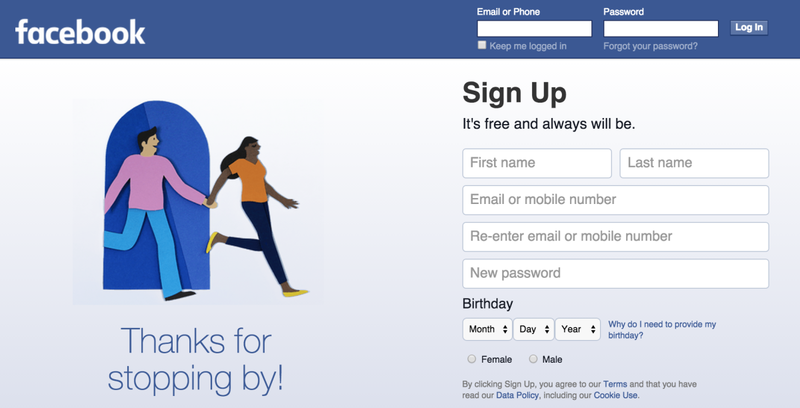 Are we supposed to be that thrilled to finally quit Facebook? The clip art couple also appear to happily dash out of Facebook in various outfit colors. Note the hand size and hair changes. It’s such an apparent clash with Facebook’s usual aesthetic, which often features cute, round characters and bright colors. Facebook this week released its design resource website; while the log off couple appears to have been around since at least late September, we’re hoping they’re nowhere near Facebook’s GitHub. Maybe Facebook is betting that you’ll never see the graphic, considering most of us hardly log off Facebook anyway. BUT I SEE YOU, ZUCK. Explain yourself.